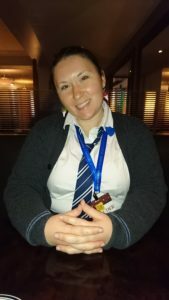 I went to LeakyCon in October and had a FANTASTIC time. My friend Austin and I celebrated our way through the weekend. 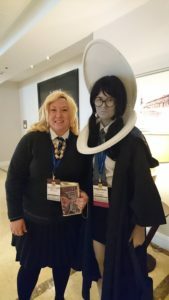 I cosplayed each day, some days with multiple costumes. 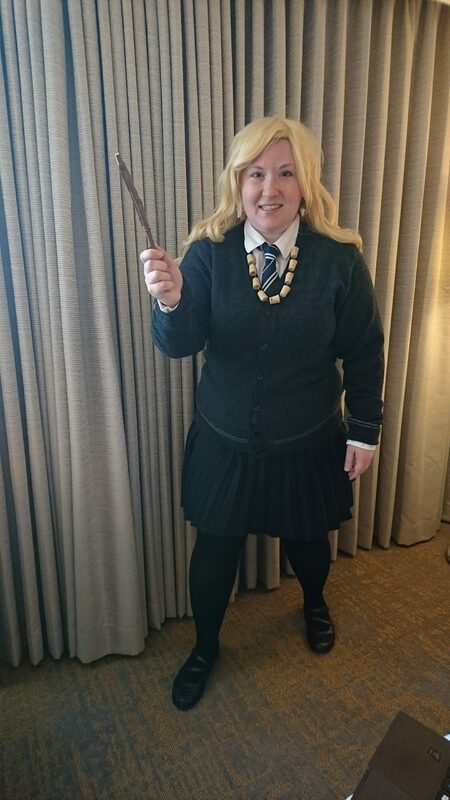 The first day, I was Luna Lovegood, and once the wig became too annoying, just a Ravenclaw student. 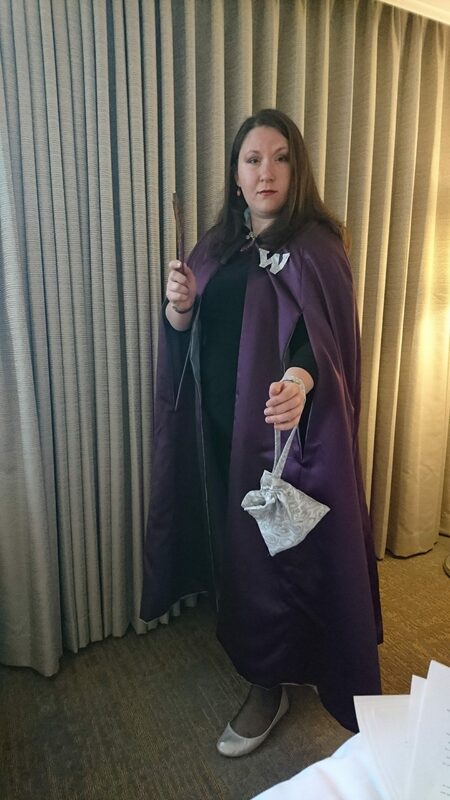 The second day, I was a Wizengamot witch for the morning, while I did my presentation. Then I changed to a stag patronus for the afternoon and evening. 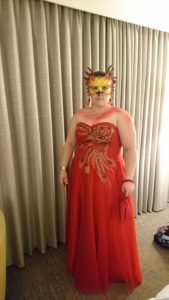 Saturday during the day, I was a Beauxbatons student, and for the ball, I was a phoenix. 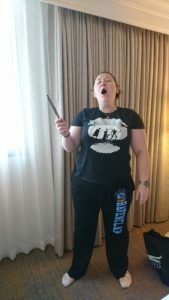 And on Sunday, I was a sleepy Ravenclaw student (Austin and I declared Sunday pajama day, and some others joined in). 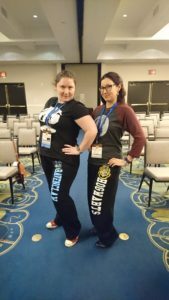 I’m sure you’ve been dying to see pictures from the weekend, so here they are! 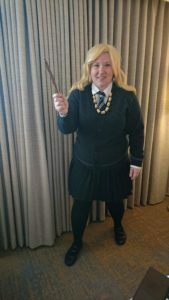 My Luna Lovegood costume was the heaviest of all my costumes. Or at least it felt so because of the wig. 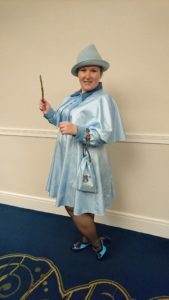 With this, i made the wand, Carl made the necklace and earrings, I bought the wig, the tie, and the sweater (from the shop that made the sweaters for the films), and my friend Tyler Beal made the Quibbler purse, which was just amazing. I took my picture with Moaning Myrtle, of course. Once the wig was too burdensome, I became a more relaxed Ravenclaw student with the earrings as a nod to Luna. 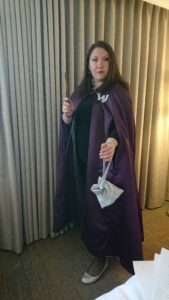 The Wizengamot wear plum robes with an elaborate silver W on the left front. I wore a simple black dress under it. My mother-in-law sewed the bag for me and cut out the W for me. My stag patronus! This was entirely purchased. The mask is a work of art by Mythical Masks. I had Austin casting me multiple times in the halls. It was a great time. This costume was the closest I got to being spot on. The hat was purchased from a store on Etsy. The dress was made by a much more talented seamstress than I am, Cherie Duggar, who was dead set on getting it right and did a pretty fantastic job. I painted the shoes. The bag has an embroidered Beauxbatons crest on it, done by my friend Tyler Beal. 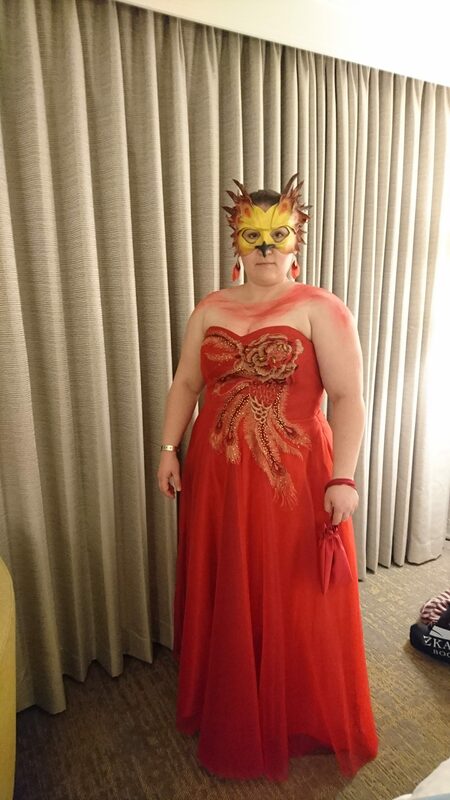 My phoenix costume involved a LOT of glitter powder. 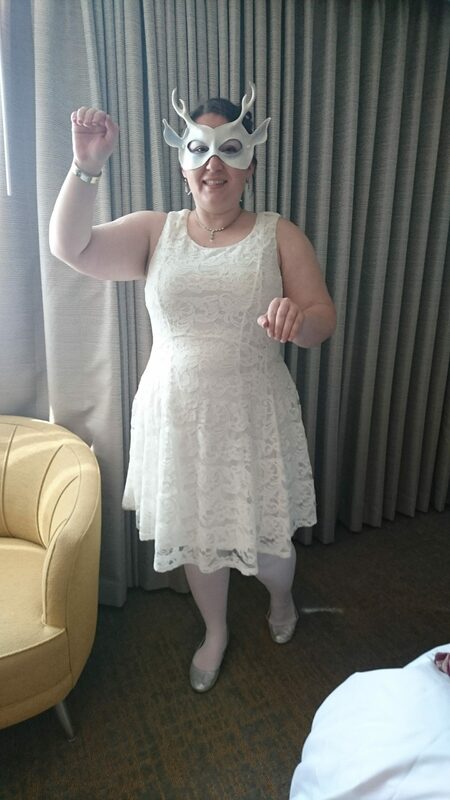 I bought the dress. The mask is another incredible design by Mythical Masks, this one custom made. I got two colors of glitter powder – red and gold, and we put them layered on top of each other. Austin helped with the glitter, particularly on my back. The last morning, Austin and I went as sleepy students. I had my deathly hallows shirt and my Ravenclaw pants (yay Hot Topic! 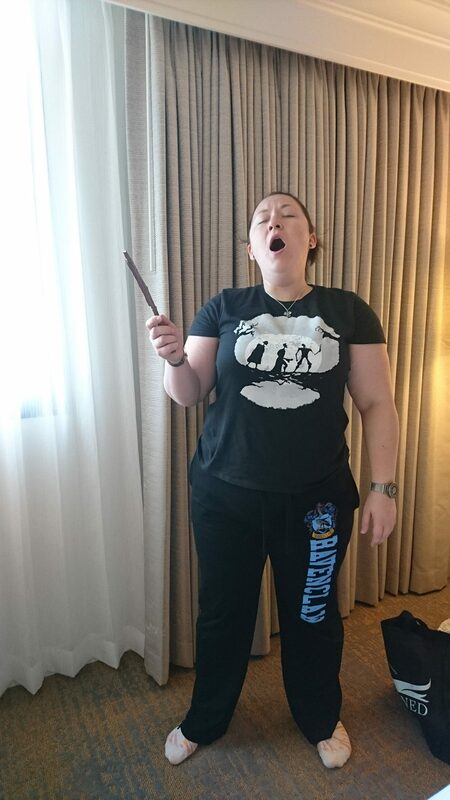 ), and Austin wore a 9 3/4 shirt and her Hogwarts pants. It was a great end to the week!